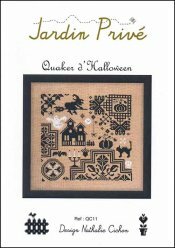 Quaker D'Halloween [E5692] - $10.00 : Yarn Tree, Your wholesale source for cross stitch supplies. Cross stitch pattern by Jardin Prive. A Halloween design with a ghost, pumpkins, a witch, Quaker motifs, and more. Stitch count 100w x 100h. Stitched on #2530 Belfast Linen dirty linen.